A Surprise in Psalm 83? For many years we have been following the conventional view of Ezekiel 38 and 39, the ill-fated invasion attempt of Magog and its allies, notably Iran. With the growing tensions between Iran—as an ostensible nuclear power—and Israel, these passages are the subject of much current discussion and debate. It is also significant to notice that the motivation of the invasion attempt by Magog and its allies is to take spoil: gold, silver, cattle and goods.1 The Ezekiel account also includes participants from distant lands. 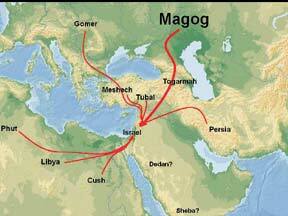 This appears to be a significant difference from the motivation of Magog and his allies, which is to take spoil. These combatants are the immediate neighbors, which continue to harass and torment Israel today and are unabashedly committed to wiping Israel off the map! The tabernacles of Edom, and the Ishmaelites; of Moab, and the Hagarenes; Gebal, and Ammon, and Amalek; the Philistines with the inhabitants of Tyre; Assur also is joined with them: they have holpen the children of Lot. Selah. Many may be surprised that the identity of the “Tents of Edom” includes the “Palestinians” of today. 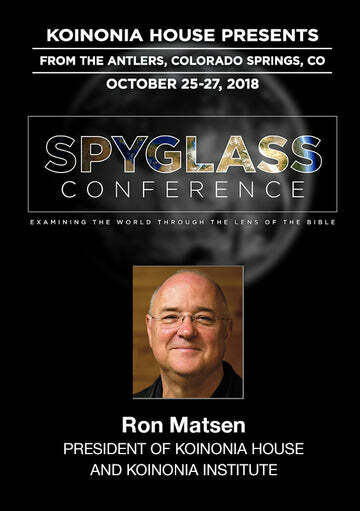 This is a topic which will be treated in a separate follow-up article, tracing the origin of the hb’yae ~l’A[ olam ebah—the “Everlasting Hatred”—from the womb of Esau and Jacob, and Esau’s contempt of the covenant birthright, to Esau’s spiteful intermarriage with the Ishmaelites, continuing the “everlasting hatred” to this very day.2 As the Babylonians took Judah into captivity, the Edomites (“Idumeans” in Greek), under pressure from the Nabateans in the east, moved west and established their own “Idumea” encompassing Hebron and environs. The other members of the Confederation can be easily identified with any good concordance or Bible Handbook. Do unto them as unto the Midianites; as to Sisera, as to Jabin, at the brook of Kison: Which perished at Endor: they became as dung for the earth. Make their nobles like Oreb, and like Zeeb: yea, all their princes as Zebah, and as Zalmunna: Who said, Let us take to ourselves the houses of God in possession. In pleading for the destruction of their current enemies, the Psalmist appeals to the God of Israel to do just as He did in their historical victories of the past. His name alone is Jehovah, not Allah, the moon-god. And the Abrahamic Covenant has not been repealed! If this view is correct, it suggests a very dramatic prelude to the events of Ezekiel 38. 1. 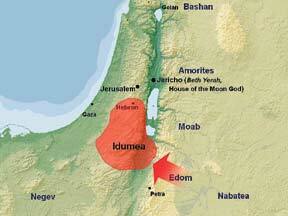 Israel is regathered in the Land (Ezek 37:12; Isa 11:11,12; Deut 30:3-5). 2. Ancient cities are rebuilt and inhabited (Ezek 36:1-5, 8-10). 3. They meet Muslim/“Arab” resistance (Jer 49:16; Zeph 2:8; Ezek 25:12; 32:5; 36:2; Obad 1:10). 4. Israel establishes an army for defense—see also #10 (Ezek 36:6,7; 38:8). 5. Adjacent Muslim nations Confederate (Ps 83:1-8). 6. The Confederacy is committed to the destruction of Israel (Ps 83:1-5, 12). 7. War starts between the Confederacy and Israel (Jer 49:2, 8, 19). 8. Title regained: “My people Israel” (Hos 1:8-10; Rom 9:25,26; Ezek 36:8-12). 9. Israel decisively defeats the Confederacy (Obad 1:9, 18; Ezek 25:13,14; Jer 49:10,20,21, 23-26; Isa 11:12-14;17:1; 19:16,17). 10. Israel has become “an exceedingly great army” (Ezek 37:10; Jer 49:21). 11. Israel takes prisoners of war (Jer 48:46,47; 49:3,6,11; Zeph 2:10,11). 12. The Region is reshaped (Isa 17:1; Jer 49:2, 10; Zeph 2:4). 13. Israel expands its borders (Obad 1:19; Jer 49:2; Isa 19:18,19). 14. Israel “dwells securely” in the Land (Ezek 38:10-12). This, then, would seem to set the stage for the subsequent events of Ezekiel 38 and 39. If this view is correct, there may be a huge surprise ready to unfold that will totally restructure the Middle East! “The only certain barrier to truth is the presumption you already have it.” Our challenge is to keep an open mind and study diligently, continually reexamining the numerous presuppositions that tend to blind us all. We are, indeed, entering one of the most exciting times in the history of the Planet Earth! May the Holy Spirit be your personal guide as you continue your “treasure hunt” of searching the Holy Scriptures to prove that these things are so! Salus, Bill, Isralestine, HighWay, a division of Anomalos Publishing House, Crane MO, 2008. Shoebat, Wahlid, Why I Left Jihad, Top Executive Media, 2005. 3. Cf. Isa 11:14; 34:5-17; 63:1-6; Jer 9:25-26; 25:17-26; 49:7-22; Lam 4:21-22; Ezek 25:12-14; 35; Joel 3:19; Amos 1:11-12; 9:11-12; Obad; Mal 1:4. April 2010 Personal Update News Journal.